So in case I haven’t mentioned this about a hundred (thousand) times on this blog, I am a huge fan of Pixar movies and anything stemming from Disney – and being the five year olds that we are (and I say we are five not because of the whole Disney-Pixar kid association, but because this is how giddy we get when we go see movies) I finally had a chance to go watch ‘Monsters University’ with my sister and as I always like to do, I decided to dissect it. First, judging from the marketing and the gags, I was guessing it would be something fairly average but it didn’t turn out to be. Pixar did do its trademark magic and the best thing I can say about it is that it is incredibly full of heart and didn’t cease to surprise. Without giving too much away, every scene was crafted with care, the dialogue was spot-on, the characters extremely well developed. I can’t remember the first Monsters much but I do remember that Mike Wazowsky (the one eyed cyclops) was the more annoying of the two, but he is the protagonist here and an extremely likeable, engaging one at that. It was also a nice surprise, because somehow I assumed the focus would be more on Sulley. The first Act sets up the story really well – introduces Mike the starry-eyed, passionate ‘scarer’ and then the story continues introducing a new motley crew of characters. It’s a college movie, buddy movie-type with monsters – but an incredibly likeable and relatable one about our two favorite monsters and how they eventually come into their own. And then there is the creepy cockroach-dragon played by Helen Mirren as the main antagonist – though I will admit I wasn’t a huge fan of the character, scary yes, and somewhat unfortunately familiar as well. But the weaker traits of the story were balanced with the greater underdog elements, every scene and subplot mellifluously functioning in a coherent, unpredictable and hilarious unit. Not to mention Mike and Sulley’s rivalry and how they fit together: Mike, a wannabe ‘scarer’ who relies too much on smarts and bookish knowledge and Sulley, a natural talent who is unable to go by the book. Speaking of scenes, one of my favorites, without spoiling is the scene where they interact with the human world (though I missed Boo terribly here!). 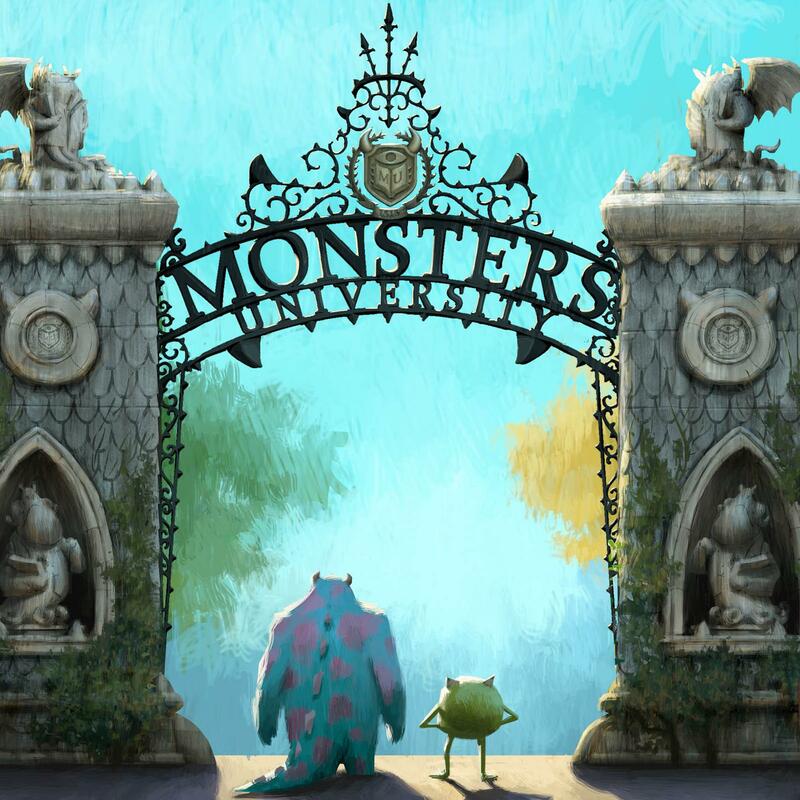 Perhaps my only grievance with ‘Monsters University’ is that it’s not an ‘original’. It’s not Toystory one or two or three – all of which despite being sequels, were certainly stories of their own. Perhaps, and this was the first thing I thought when I heard plans for this sequel – there was no ‘real need’ for a prequel – something that seems very akin to Dreamworks’ money-making tactics with the Shrek sequels. Did anybody really need to know how the two monsters met? Wouldn’t a better sequel have been a continuation of the first saga? Not sure – however, I still really enjoyed it. Not a classic like the toystory sequels, but still worthily entertaining and well worth some time and money. So go see it (it’s 78% on Rotten Tomatoes) and let me know your thoughts if you have any! For more movie rants or just plain ol’ curiosity, here’s my previous ‘Man of Steel’ review. New posts on drafts, where to learn screenwriting, and more coming up in the next two weeks. Have a great weekend!